The spine curves to the side as a single curve to the left or to the right. 1. With the adjustability of the backrest and seat angles, the chair set up can be adapted to your own personal requirements in order to provide the maximum benefit. 2. The inflatable and height adjustable lumbar support keeps you in a healthy upright posture with your back supported in the right place and not pushing you in the wrong place, for maximum comfort. 3. The upper backrest supports between the shoulder blades to help encourage an open chested posture rather than pushing you forward into a slouch. We can provide an additional inflatable support for this area as well, which previous clients with scoliosis have found very helpful. 4. The height, depth and width adjustable armrests will ensure you can support your arms close to your side, which takes the pressure and tension build up of heavy arms, off the shoulder, neck and upper back. 5. The chairs are available in 3 sizes so we can recommend the right size to ensure a true fit. 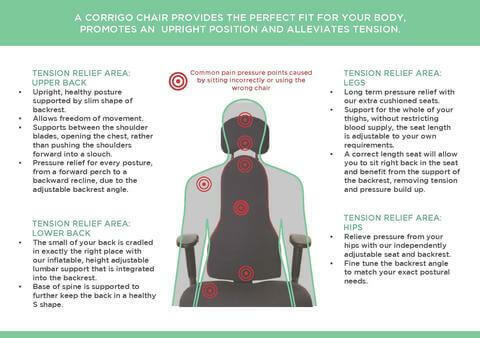 or click HERE for more information on the the Corrigo chair for Scoliosis, the Libero.